Black diamonds range from genuine diamonds that are naturally black to anthracite (hard coal) to synthetic black stones. For that reason, you’ll see a range of prices all under the heading of “black diamond jewelry.” Be sure to check the fine print on black diamonds to determine if they are natural diamonds. Regardless of the actual material or the cost, however, black diamonds are chic, sophisticated and full of shine. 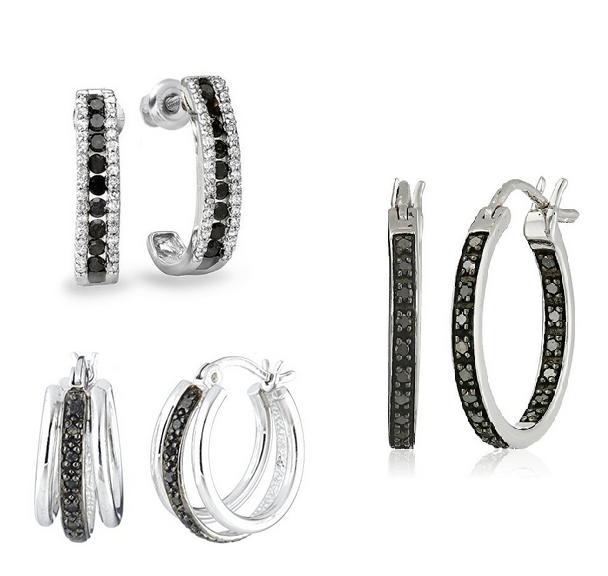 Black diamonds look stunning set against white diamonds and a variety of metals, such as white gold or sterling silver. 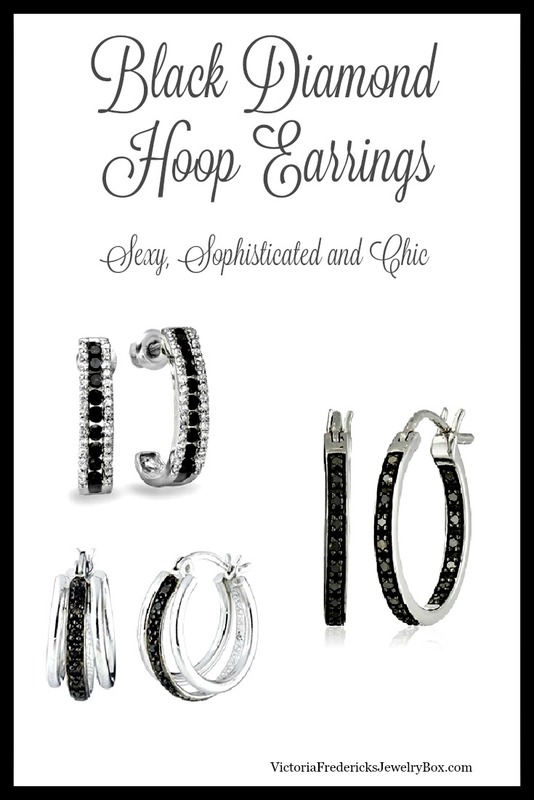 You’ll see all that and more here, in a collection of styles and sizes of trendy, elegant hoop earrings. I’ve included designs for both women and for men. No matter where you are going, these gorgeous earrings will be the perfect accessory. Since they combine white and black diamonds, there is no need to worry whether they will coordinate with your other fine jewelry. Diamonds match everything whether they are black or white. The combination of both, black and white diamonds, equals perfection. Each of the sets featured below are listed as natural diamond gemstones. Keep in mind though, they will be smaller than they appear in the photos. Sometimes you prefer the simple elegance of black all by itself. Either set of the hoop earrings featured below, would be perfect for the office or for play. I have included two pairs of earrings that have the black diamonds set in sterling silver (left & center). There is truly something here for every price range. Also, some of the diamonds have been heat-treated in a lab to improve their appearance, but the are all natural black diamond gems. Frankly, that also allows a jeweler to make them more affordable. Your man will definitely be in high style wearing these 3.50 Carat (ctw), Black Round Diamond Hoop Earrings set in white gold. He could wear one at a time, or both if he prefers since they come in a set. These high-end men’s hip hop style earrings are made from 100% natural black diamonds. That is an amazing 3.5 carats worth of bling! The prong set is in 14k white gold and the earrings feature a hinged closure. With any gemstone, you want to avoid allowing them to come in contact with hairspray, perfumes or other chemicals. I recommend putting your earrings on after you have completed your make-up routine. Since most black diamonds in earrings are treated, you should clean your black diamond earrings with a mild liquid detergent, like Ivory, and warm water. Anything else, could be harmful to your gemstone.